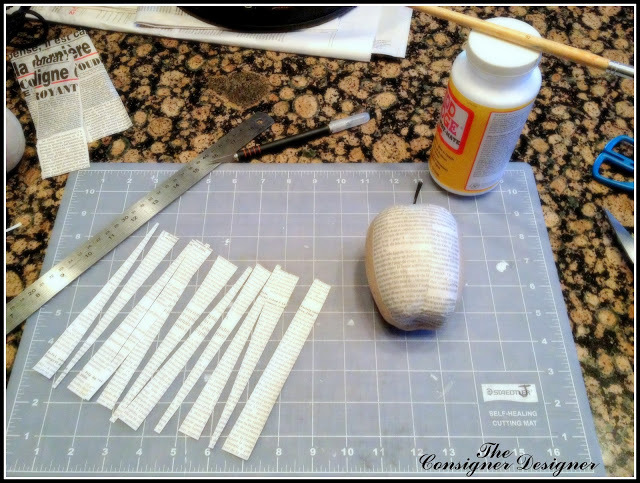 The Cosigner Designer website has been gone for a while, but there are some really great DIY posts that were lost when that site was taken down. Here is one of my favorites. If the original owner would like this removed, please contact me. 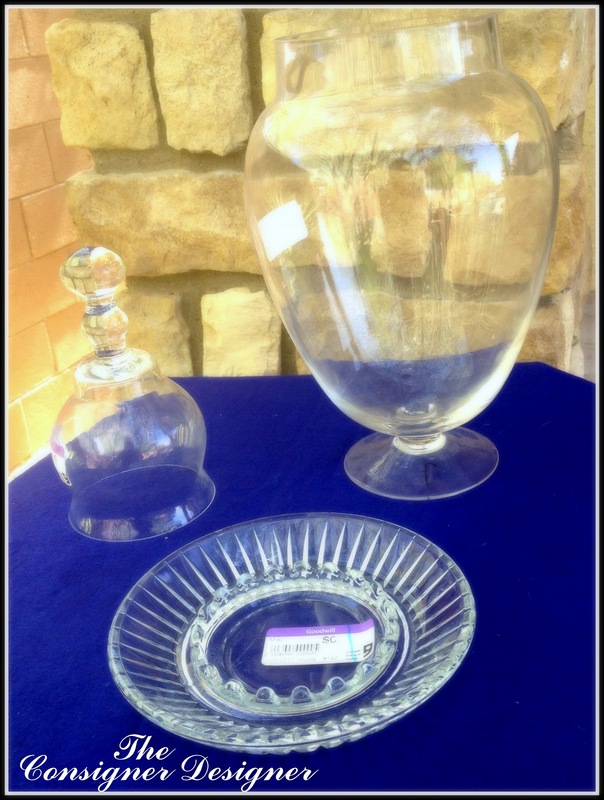 What do you get when you mix a Vase, an Ash Tray and a Mini Bell Jar? A DIY Cloche! I am going to show you how to make your own Cloche using some great thrifty finds and some unique fillers for that Cloche using Mod Podge and news print, in this case, French Press news print! When I found these three items at my local thrift store I knew right away what I wanted to do with them! A quick and simple tip I want to share with you is how to remove those darn stubborn price tag stickers from glass! I don’t know about you, but those things drive me crazy! Remove as much of the sticker tag as possible. 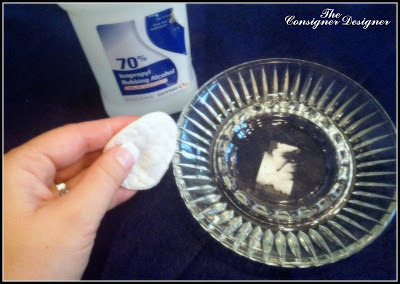 Take a cotton pad and some rubbing alcohol, wet the cotton pad and scrub the the remaining glue off the glass. It takes a little elbow grease, but it comes right off! Allow it to dry for a few seconds and then clean it with glass cleaner and voila!! After my glass was clean. I took a heavy duty glue that I knew would dry clear. I used Scotch Maximum Strength Adhesive. When they say Maximum Strength, they mean in bonding and in smell. Use in a well ventilated area! 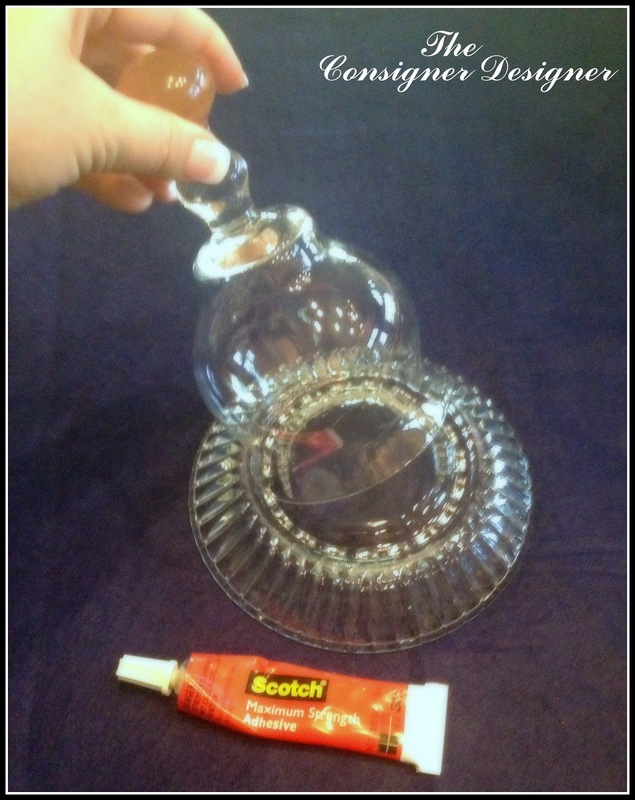 I flipped the ash tray over, lined the rim with my adhesive and set the mini bell jar in place. ( Hint: Make sure all your components work together when you find them before attempting to glue them together forever!) I allowed it to dry over night and now I have a lid to my Cloche! Easy as 1, 2, 3! Literally! 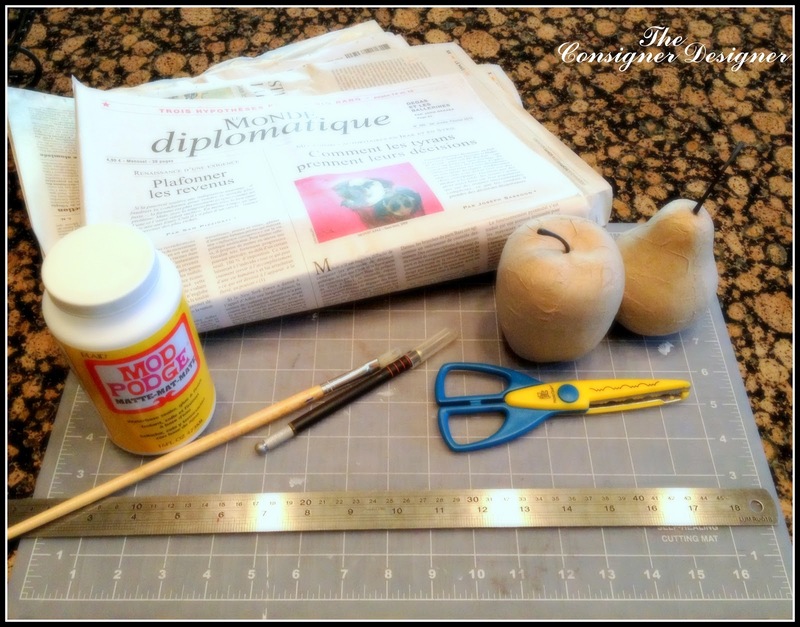 Now on to those fabulous French Press Fillers! When looking for News Print to use, look for fun articles, bold prints and colors. Anything that relates to you or you find symbolism in! The News Print is easiest to apply in strips. Cut out the article you want (the bigger the article the better) using your Scissors. 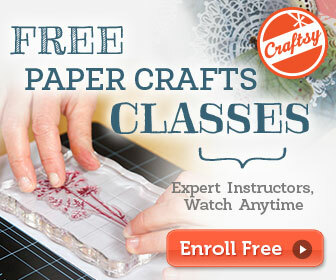 (either decorative or straight edge) Using your Steel Edge Ruler and X-Acto knife, cut the paper into small strips. You can cut them vertically, horizontally, or on an angle depending on the look you want to achieve. I used all three methods for different pieces of Fruit. You then simply dip your Paint Brush into the Mod Podge and cover a small area on your surface. This will allow you to place the News Print and reposition if needed. Once the News Print is in place, cover with another layer of Mod Podge. Try to smooth it out as much as possible. Don’t worry if it is not perfect!! 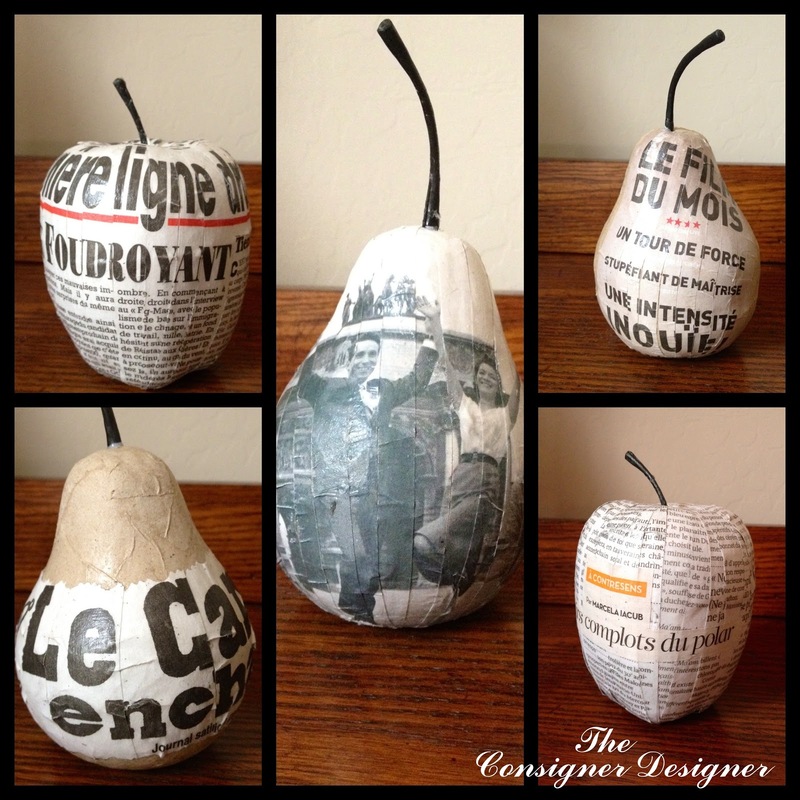 Continue on with this process until you have your entire piece of Fruit covered in News Print. 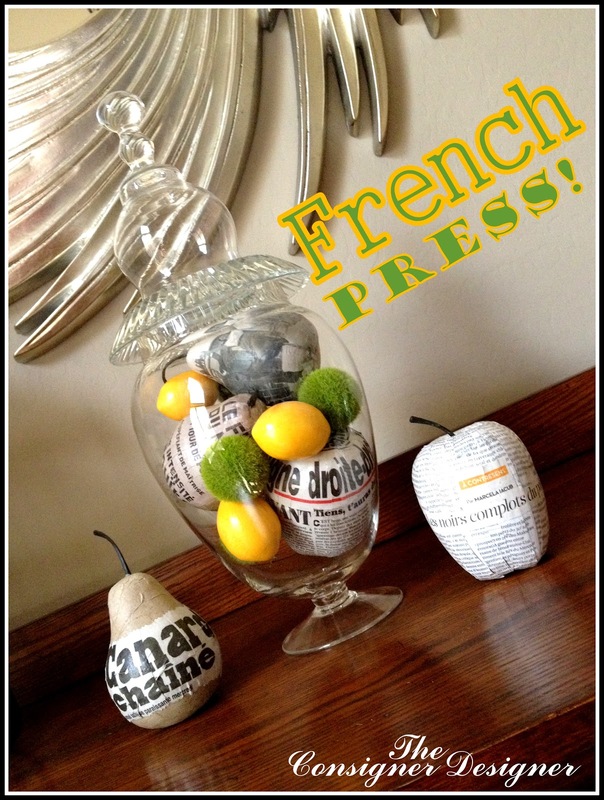 Here are the pictures of my final pieces of French Press fillers! Aren’t they just so fun? My favorite it the couple jumping for joy in front of the Arc de Triomphe! Once they were all dry, I placed them in my DIY Cloche. 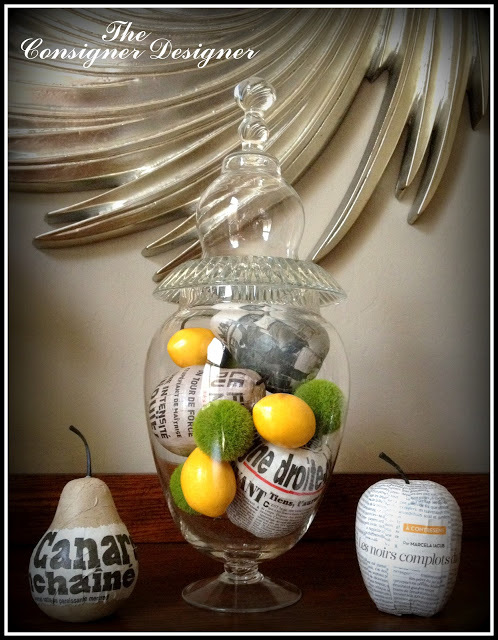 I used some fake green balls and some fake lemons for filler in the negative spaces and to add a little color. I just love the way it turned out. All of it cost me a total of $9! Can’t beat that! !